So far I've managed to get as far as the F2 line as the last two years there's been no seed set. Last growing season and not by design ended up sowing the bulbils much later than i would, late summer, so the results are a shorter plant of 60cm tall and has 2x the amount of flowers over previous years , planting the bulbils later may not be why a different growth habit, we are currently having a start to summer that is quite rare- wet cool and cloudy, normally the hills are changing to a light terracotta colour and the fire bans have been declared, but then this sort of weather is what the Allium family love, my other onions are the best they have been for a few years. But maybe this has helped with the number of flowers per scape?. 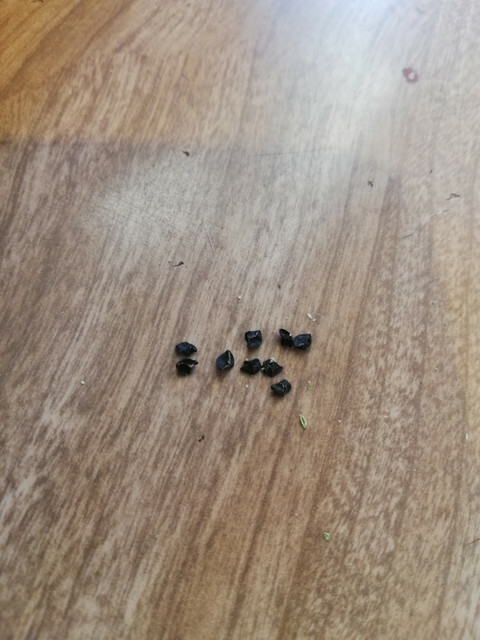 Managed to get 9 seeds which is not as much as I would have thought I was going to get considering the number of flowers, oh well it F3 seed, now hopefully they can germinate. Looks very interesting! Good luck with those seeds. Richard: For good seed set do you remove the bulbils like you would in garlic? I haphazardly attempted hand pollinating some of the walker flowers this last year but with no luck. I've thought it would be interesting to cross walkers with bulbing onions because of the extreme drought tolerance that I've seen in walkers. Have you attempted any crosses like this? I must get back into my project with this. I did get a topsetting onion out of Green Mountain potato onions, a couple of years ago, replanted the bulbils, and didn't get any topsets! 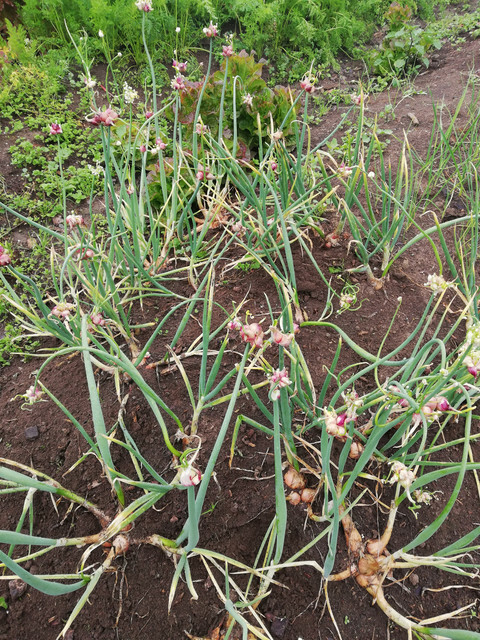 I was thinking of intersowing with other bulbing onions to see what happened - maybe next year. I got seed one yea after strenous de-bulbing, but didn't get any results from the seedlings - probably lost them somewhere in the garden anarchy. I ordered a seed packet from Sherck seeds this year because they are offering what is supposedly the other parent Allium fistulosum with Allium cepa. So I am thinking if they cross I should get some walking onions. I found some walking onions growing in a creek bed last year, pretty sure I mentioned them over on HG. They had seeds which I can't seem to locate right now but in any even I just found the ones I transplanted are alive! The are growing in my patch with my other walking onions so here's hoping I get some more seeds. Also intend to go back that creek and dig up more plants, there were quite a few there. They are very different than others I have with lots more and much smaller bulbils. When I found them I tough they were garlic at first. Anyway, if I do get seeds I'll save some for you. I lost the walking onions a neighbor gave me as a kid a few years back. I went to a seed swap a couple years ago and somebody had small bulbs labeled as such. I grew them out and - garlic! 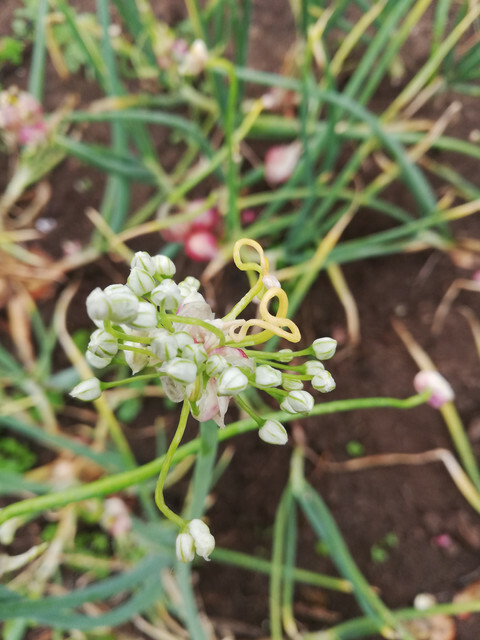 Ive had such demand for the walking onion bulbils on our Sentinels website that I really do have to up the amount I plant, so instead of eating the base onions I'm going to plant all the F2 generation in the next week or two. I have known people who have kept replanting the base onion and not the bulbils and have had them over time stop producing the bulbils. I have four kinds now and not sure I haven't had some seeds now and then but I haven't really tried to collect and plant them. The new one I found last year has much milder flavor than any of the others so I hope it makes seeds and maybe crosses with them. All the others are very very strong and hot flavor, we don't much eat the bulbs but it the leaves are good chopped and used to add onion flavor to things. My original kind that I'v had for many years just grows basically wild. Except for that newest one they all look and taste pretty much exactly the same. It is mostly white, maybe a little yellow but no red at all. When I dug up plants they were very deep in the ground and did not have divisions, each stem just ended up at single extremely round bulb. I don't really know what they are, I'd almost say they are a cross between onion and garlic except I don't think that is possible. They taste like a mild flavor onion. I hope maybe they are a cross between some old cultivated onion and one of the several wild ones that grow around here. I also have a patch of the potato onions and some shallots planted nearby, a couple of them made bulbils last year. I'm hoping they all kind of mix up and turn into a diverse strain of winter hardy onions that I can just let grow pretty much on their own. Except for that newest one they all look and taste pretty much exactly the same. It is mostly white, maybe a little yellow but no red at all. When I dug up plants they were very deep in the ground and did not have divisions, each stem just ended up at single extremely round bulb. What a fantasizing strain that one is, could just about say my strain is on the other end of the spectrum, divide up before re-emerging from the ground. I called them Bloody Run onions because that is the name of the creek I found them in. They are growing in deep gravel and sand along the edge and that area has to get flooded every time a big storm hits. There were tons of little bulbils on the pants I found so I only dug up four of the bigger ones, but none of the little ones grew, or at least not yet, I'm hoping they are still alive and might sprout. Two of the four bigger ones are growing and maybe the other two are also still alive. The bulbs were deep in the ground, probably 8 inches, which I suppose helps them not get washed out during times they are under water. I thought they would be easy but I'm not sure they like the organic clay soil in my garden. I suppose that if they are something that escaped cultivation a long time ago or if they are some kind of cross with something wild maybe they are adapted to growing in deep gravel. Or maybe they are completely wild, I don't know. But I have two for sure alive and growing with my other walking onions. Hopefully they will make some seeds and maybe cross with the others. I'm also going back the creek to collect more seeds and dig up some more plants. The flavor is so much better than my other hardy onions so I would really like to get a nice big patch established. Interesting name for a creek, was there an abattoir nearby at some stage?. So no true seed on those Bloody Run onions reed? Yep, the creek is named for some supposed battle during colonial times, don't know the whole or real story on that. And yes when I found them they did have seeds, I planted some right away, that was last summer but they didn't grow. My fault as I just scattered them on the ground. They might have sprouted and then dried up, I didn't pay good enough attention. I have a few more saved but can't find them right now, I think they are in the freezer. I just a few minutes ago, discovered that several of the bulbils that I though had died are also starting to sprout. Now I should have a good start of them to try to get more seeds. I'll also go back to the creek and try to collect more.